After spending several weeks back home in Maryland, we travelled to the Lone Star State to spend some quality time with family in Houston. 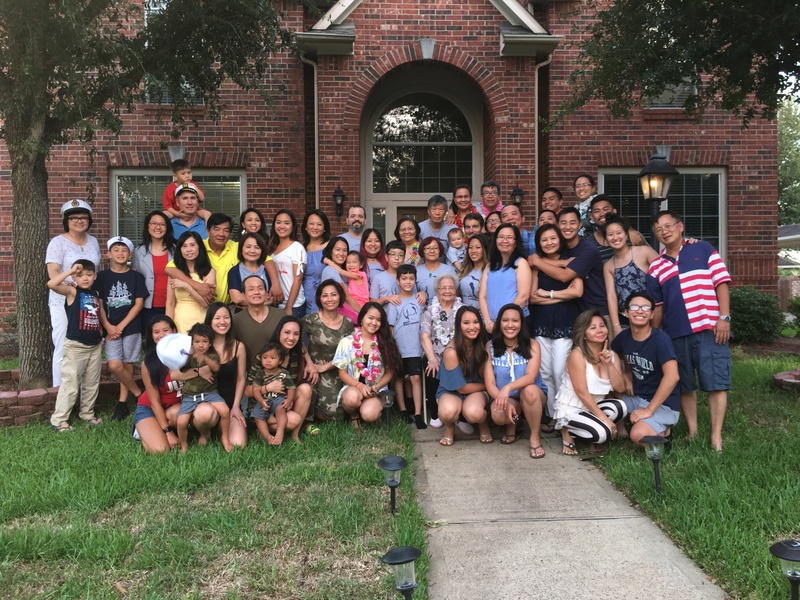 J’s Grandma was celebrating her 89th birthday (90th if you go by the Vietnamese calculation where the newborn starts at 1 versus 0) and D’s uncle was celebrating his bday and his cousin was expecting her first born over the 4th of July weekend. These were great reasons to get to Houston, plus It’s kinda sorta half way towards getting back to Tin-E in Washington state – win all around! Speaking of wins, we were so grateful for the opportunity to head to an Astros’ game with Uncle Jimmy. The Stro’s are on fire and they didn’t disappoint with a win over the A’s. Minute Maid Park is where the Astros play and it’s an indoor ballpark which initially sounded a little strange to me. As baseball fans, we’ve been to our fair share of parks, but this is the first indoor and air conditioned spot we’ve been to. Lemme tell you, when it’s about 100 degrees outside and a torrential thunderstorm hits in the 4th inning, you better believe that watching baseball indoors is the greatest thing ever. Staying with Uncle Jimmy and Aunt Diane was a ton of fun and we can’t thank them enough for all of their hospitality. The only thing they weren’t able to produce was a new member of the family, as Baby G was still marinating at the time of our departure. We can’t wait to meet the lil guy soon. E and Lil D didn’t seem to mind as they were in love with Sugar, my Uncle’s golden retriever. As fellow entrepreneurs, we were extremely impressed to catch two fantastic meals at my cousin’s new restaurant, Relish, in River Oaks. She and her husband have done a fantastic job to bring this classy casual spot to H-town. E is still talking about the “popcorn” cheese cake and I would love for someone to deliver a pork chop and Brussel sprouts to me as I type this blog post in Canada. For our growing number of Texas based readers out there, be sure to check out Relish soon! Speaking of food, I’m pretty sure Nguyen when translated from Vietnamese into English means, “The family with 3 stomachs.” J’s family can absolutely get down and her Grandma is Pho-nomenal (see below for proof). The proof you seek is her children and when I say children, I mean her soccer team with a couple of substitutes as she had 10 daughters and 3 sons! There are so many grandchildren and great grandchildren in the family that the excel spreadsheet I use to track all their names crashes my computer every time I try to access it. Oh yeah, we definitely had multiple party crashers every day the Nguyens’ held a party. No one cared – it was just another person to meet and have fun with. In fact, next 4th of July weekend, all the 10’s of 10’s of our readers could come down to Houston and no one would blink an eye. Be prepared to eat amazing Vietnamese dishes, 150 pounds of crawfish, Korean bbq, Pho, Chinese 12 course meals and so much delicious lemongrass bbq pork that the meat looks like a crime scene. Oh yeah, bring your running shoes too because you’ll want to run away from a certain Uncle who wants (demands) you to drink something that smells like alcoholic fish sauce but is some form of Vietnamese moonshine! Or, maybe moonshine is your thing. In that case, you’ll probably be asked to come back the following year too. Family time in Houston was more fun than I could have imagined. Both sides are wonderful and we are so grateful to be a part of such kind and loving families. The time was so enjoyable that J and I have been talking about having another dozen or so kids to add to the excitement. Who wants to be adopted? Thanks Auntie Maryann – I’m sure everyone would be happy to have you if you came!